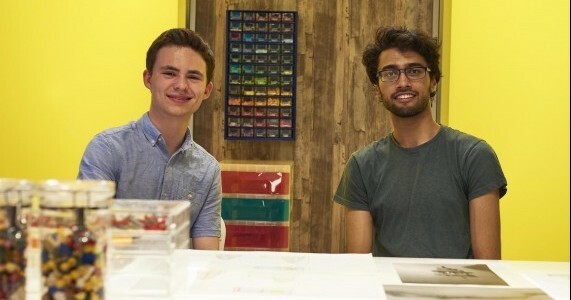 MET student James Gard and fellow Cambridge Engineering student and LEGO enthusiast, Jamil Jami, are competing in a new Channel 4 series to win the title of ‘LEGO Masters’. The Clare College duo, who are about to enter their fourth year, will show off their construction skills, imaginations and creativity ‘in a battle to be crowned masters of the brick’ as part of the TV series LEGO MASTERS. Leading the hunt for the nation’s best LEGO builders are Matthew Ashton, Vice President of Design at the LEGO Group, and numerous guest judges including Roma Agrawal, structural engineer of The Shard. In the first episode, which aired last night (Thursday 24 August) and which is available to watch here, James and Jamil were challenged to create a LEGO banquet, including one seat to take the weight of an adult and at least one supersized masterpiece for the table. What they came up with was an impressive ‘explorers’ chair and candelabra’ complete with waterfalls and a jungle theme that has seen them progress to the next round. LEGO MASTERS host Melvin Odoom was the one that got to test the chair; as he sat down a hidden temple rose out of the top of the chair thanks to James and Jamil’s clever in-built lever system. Guest judge Roma Agrawal said she was impressed by the students’ engineering skills and the effect they had created with the jungle theme. James said their decision to enter LEGO MASTERS came down to the fact that both Jamil and himself had co-founded BLOC Soc – the Clare College-based LEGO Society – and they had been running events ever since. “We heard about the opportunity to compete in a LEGO competition and threw ourselves into it,” he said. “We had to go through some tricky auditions during term-time weekends which put a lot of pressure on us with work, so we went in not expecting to get very far but hoping to enjoy the experience if nothing more. Turns out that we are far better builders than first thought and we ended up getting on the show. “Studying Engineering has been a great way to enhance our creative minds and it has led to us building some quite technical things out of LEGO. “BLOC Soc has run numerous LEGO Mindstorms sessions in which Jamil and I have helped build a self-balancing model of a segway and a Wild West-style shoot-em-up game – using just LEGO Bricks. Across four, hour-long episodes, eight pairs of amateurs compete against each other in a ‘wide array of disciplines from the playful to the technical to the unexpected’. Both students have been inspired by LEGO from an early age. “Lots of people grow out of it, but Jamil and I saw no need in ever giving up the block – it's such a great building material,” said James. “My earliest memory with LEGO was getting a little moon buggy when I was about four-years-old. I thought it was really fun but it was only when I was given a LEGO train set that Christmas that my passion for building really took off. I used to love making my own locomotives and carriages. That led on to building scenery, architecture and eventually whole landscapes. It's very therapeutic to build according to instructions in the same way that it is enjoyable to do colouring by numbers or make a puzzle. “I find that building LEGO sets are a great way to switch off during term time which is why we founded BLOC Soc,” he added. LEGO MASTERS is at 8pm on Thursdays, on Channel 4.